This wood floor in a St. Clarksville home is sinking by 1/2". It's located over a crawl space. At Baker's Waterproofing, we can quickly and effectively repair a crawl space structural issue with our heavy duty crawl space jacks. 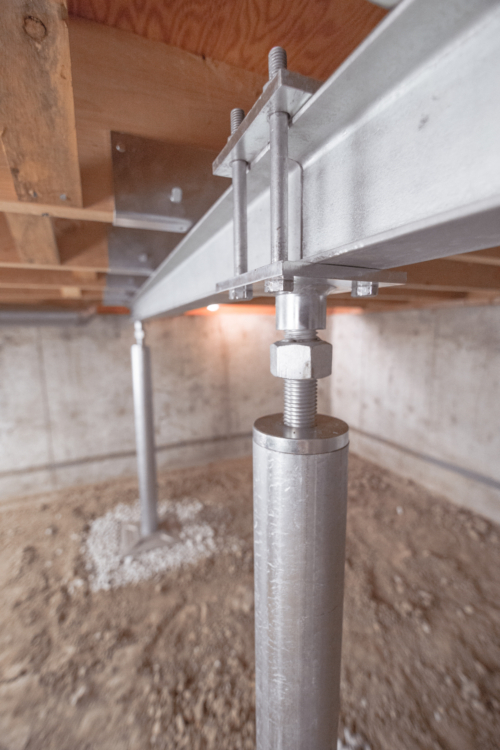 Crawl space jacks are adjustable steel posts that will stabilize sagging crawl space structures. During installation, we prepare a base of compacted, engineered fill at all jack placement points, located directly beneath the main support beam. We install a pre-cast concrete base on this fill and then extend a crawl space jack between the base and the beam. Our team of professional foundation contractors can help. During our foundation repair quote, we'll personally inspect your foundation issue, explain what's happening with your home and make suggestions for repair. Each of our visits comes at no obligation, and it includes a written foundation repair estimate. To schedule your free quote, call or e-mail us today! We proudly serve Greensburg, Washington, Bethel Park, surrounding areas such as Bethel Park, Mount Lebanon, Cranberry Township, Butler, Greensburg, Beaver, Wheeling, and nearby.